"I'm not answering any questions," he said, smiling. "I'm not one of the answering people. I'm the storyteller." Abel Tannatek is the storyteller. He is a young man hiding an ugly reality behind pretty words and magical happenings. In order to find out what he is hiding, we are forced to slowly watch as the layers of his true self are revealed, one ugly layer at a time. Secrets are the only method of survival in a world where you can count on no one but yourself. Secrets are the only choice you have when you must protect the life of an innocent. Enter Anna. Sheltered, clueless Anna. She has no idea of the darkness and danger outside of her safe little world. It's late, Anna...they'll be waiting for you, at home...in that house where the air is always blue...they'll be worried. A chance meeting between the school's drug dealer and an innocent, sheltered student came about because of a lost doll. Had Anna not found the doll, she would have carried on her life as usual. There would be no danger, no mystery, no killing for her to know about. One might say that finding the doll was the worst thing that could have happened to her. I would disagree. Abel is a broken human being. He's broken to the point of ill repair, yet Anna still sees something in him that's worth saving. As we see Abel through Anna's eyes, we are shown just how much a person will endure in order to spare a life so precious to him - the life of a tiny little girl in a pink jacket. Abel and Anna bond through time shared as Abel spins wonderful fairytales into existence for his younger sister. Real life becomes the backdrop for the fantasy. Characters in reality become characters in the story. A mystery starts to unfold as characters in the story become bigger players in crimes which start taking place in the real world. Who is the killer? Why does Abel seem to have so much to hide? Why are other people interested in what Abel and Anna are up to? I can't divulge much without going into spoiler territory. 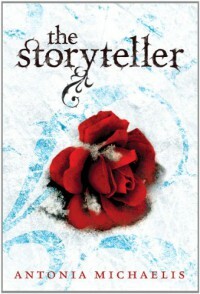 The Storyteller is so beautifully written. The depth of character and layers of detail are heart-breakingly intricate. After I finished, I was left with a few different emotions. Anger and sadness were probably the two most prominent, but I can't say that I have any regrets reading this book. I had a hard time putting my reader down because the story of Abel and Anna was such a pull. As for the character flaws...I suppose I should address those. Both Abel and Anna disappointed me in a way because of their actions, yet I felt as if their actions made them more real. Abel was abused, so he had no other experience to draw from in learning how to interact with others. Anna had an empty but satisfactory life and she craved more than her own existence inside of a pretty box. Abel was able to give her something she'd never had before and because of this, she was quick to forgive at times when others wouldn't. Right or wrong, I understood why.